Whether you’re building a new home in Land O’ Lakes or redoing your floors, hardwood flooring is a great option if you want a more traditional look. Hardwood flooring has been popular for decades because it’s a beautiful option for every room of your home. It helps the space feel warmer, opens up the room, and makes the environment more inviting and comfortable. If you’re exploring different options for your new floors, hardwood flooring is a material that is timeless and beautiful. 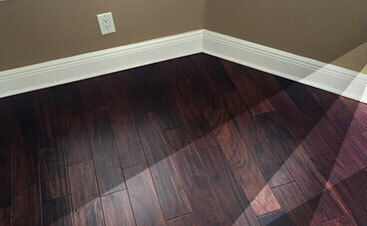 When you’re ready to get started, contact 2 Day Flooring for an estimate and installation. Hardwood flooring makes a statement that turns your house into a home. It makes a space feel warm and cozy, all while being a practical flooring solution. It’s durable in high-traffic areas of your home and is also easier to take care of than many people realize. With a little bit of care and maintenance, your hardwood flooring will last you for years. Hardwood flooring is also easy to customize without losing its innate beauty. When choosing hardwood floors, think about the qualities of different wood, like the different colors, the grain, the texture, and the hardness. There are also different stains to change the color of the hardwood, and different finishes that will make your floors more glossy or leave them more rugged. Hardwood flooring is a great option for so many because, no matter how it’s customized, it always looks phenomenal. There are many reasons why hardwood flooring could be the right choice for your home. It is a natural material that is sturdy, durable, and will stay in great condition for a long time. There are plenty of products you can use to keep your hardwood floors looking brand new, and they’re just as easy to apply as products you would apply to other floor types to clean or maintain them. They do need more maintenance than other materials, but the beautiful results are worth the warm and inviting space that hardwood flooring creates in your home. Don’t forget how much you can customize the appearance of your floors. Hardwood flooring has a lot of natural colors that might surprise you. From deep browns and reds to almost white, and even some yellows and greens, hardwood flooring is a great way to add a unique and beautiful touch to your Land O’ Lakes home. When it comes to installing hardwood flooring, you want to choose a company that understands the time and effort it takes to make a home more beautiful with this stylish floor style. 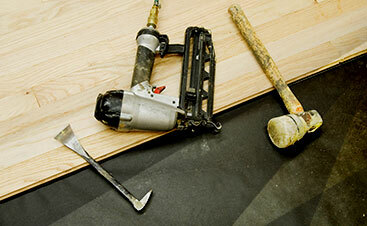 At 2 Day Flooring, we work to install your floors perfectly and in a timely manner. We will work with you to choose the flooring option that will suit your needs best, never trying to upsell you on something that isn’t going to work. If you’re ready to start your flooring project in Land O’ Lakes, contact 2 Day Flooring for a free in-home estimate. ©2019 2 Day Flooring Inc. - Do not copy. All rights reserved.